1853 Outer cover from Poole to Exeter showing on the reverse a SUPERB POOLE SKELETON DATESTAMP in Brown. 1846 Printed "Law Life Assurance Society" entire from London to New Saram, Wilts, showing a fine "SALISBURY/DE 15/1846/2" SKELETON DATESTAMP IN BLACK, WL655. 1858 1d Rose-Red, SG 40, tied to envelope from Beaford, Devon, to Fettercairn, showing a very fine CALEDONIAN RAILWAY 'CR' IN RED, W632a. 1856 Envelope addressed to Antricco? franked by two 1d Red-Brown, SG 29, cancelled by an ATHLONE (ENGLISH TYPE) SPOON CANCELLATION, CODE B. VERY SCARCE. 1871 Printed cover from Bradford addressed to Hull, Yorkshire with, on the reverse, a very fine 'S.T/HULL/MR 8/71' Sorting Tender datestamp, W271. 1858 Envelope addressed to Ireland with 1d Rose-Red, SG 40 , tied by a superb Charles Rideout No 1 Experimental duplex with EIGHT SHORT BARS ABOVE DIAMOND. Superb. 1858 Envelope addressed to Hurstpierpoint, Sussex, franked by a 1d Rose-Red, SG 40, P-H, and tied by a very fine MALLOW IRISH-TYPE 'SPOON DUPLEX, Code C. VERY SCARCE. 1846 Entire from London addressed to "Cotesback" showing a very fine MISSENT TO/LOUGHBOROUGH IN GREEN and then a three-line MISSENT . TO/LEICESTER/97, with mileage below, in BLUE. AN UNUSUAL DOUBLE MISSENT. 1855 1d Red-Brown, SG 29, tied to FRONT by a superb TYPE A1, CODE 1, DUBLIN 'SPOON' DUPLEX IN GREEN. Circa 1872 2d Blue, SG 45, Plate 9, tied to O.H.M.S. India Office envelope from London to Brechin showing a very fine CALEDONIAN RAILWAY 'CR' IN BLACK, W 634, 5mm. 1851 1d Pale Red-Brown, SG 9, tied to entire from Marnhull, 'No. 6' Receiver, to Shaftesbury and tied by a fine SHAFTESBURY 698 NUMERAL IN BLUE. 1845 1d Red-Brown, SG 8, tied to cover to Ulverston showing a very fine Type 5 GOSFORTH/PENNY POST in Green, CU 278 alongside. 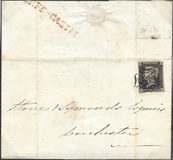 1860 1d Rose-Red, SG 40, Pair, tied to envelope used locally BY TWO PEEBLES CIRCULAR DATESTAMPS IN BLUE. 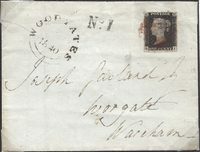 1856 1d Red-Brown, SG 29, tied to envelope to London by a fine TYPE 1 INVERNESS EXPERIMENTAL DUPLEX, Code B. RARE. 1856 REGISTERED ENVELOPE to Kings Lynn franked by a 1d Rose-Red, SG 40 and 6d Lilac, SG 70, and tied by TORQUAY 805 NUMERALS IN BLUE. ATTRACTIVE.